1 Preheat oven to 400°. Grease 13 x 9-inch glass baking dish with 1 tablespoon olive oil; set aside. 2 Cut squash in half lengthwise. Scoop out seeds, discarding as much stringy pulp as possible. Rinse seeds with cold water in sieve; reserve. 3 Arrange squash in prepared dish, cut side down, then pierce with fork. Roast 45 minutes or until squash is very tender; cool. 4 Heat remaining 2 tablespoons olive oil in 4-quart saucepot over medium-high heat and cook onion, celery and carrots, stirring occasionally, 10 minutes or until crisp-tender. Stir in garlic and Knorr® Chicken flavor Bouillon and cook 2 minutes. Scoop flesh from squash into saucepot. Stir in water and bring to a boil over high heat. Reduce heat to low and simmer covered 30 minutes or until vegetables are very tender. 5 Meanwhile, heat 8-inch skillet over medium heat and toast reserved squash seeds, stirring frequently, 15 minutes or until crunchy. Season, if desired, with salt; set aside. 6 Cool soup slightly, then process, in batches, in blender or food processor until very smooth. Return soup to saucepot; keep warm. Stir in 2 teaspoons chipotle peppers. 7 Combine crema, Hellmann's® or Best Foods® Light Mayonnaise and remaining 1 teaspoon chipotle peppers in small bowl. Season, if desired, with salt and pepper. 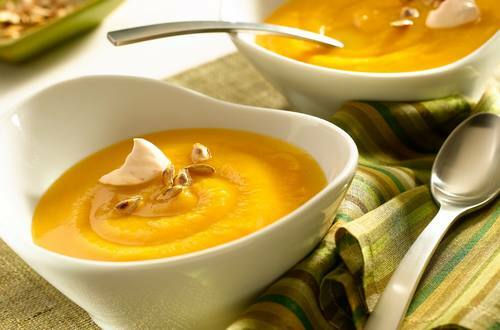 Garnish soup with dollop of chipotle cream and toasted squash seeds.